In less than three weeks from now, on February 20, Samsung will be officially announcing the Galaxy S10, its next-gen flagship smartphone family. While the company hasn't shared too many details regarding the S10 series, a steady stream of leaks has been providing us with a lot of info about the upcoming phones, and we've even seen multiple renders and live photos allegedly showing the devices. Now, for the very first time, it appears that we can take a look at what's reportedly an "official" press render of the Galaxy S10+, the largest handset in Samsung's new series. 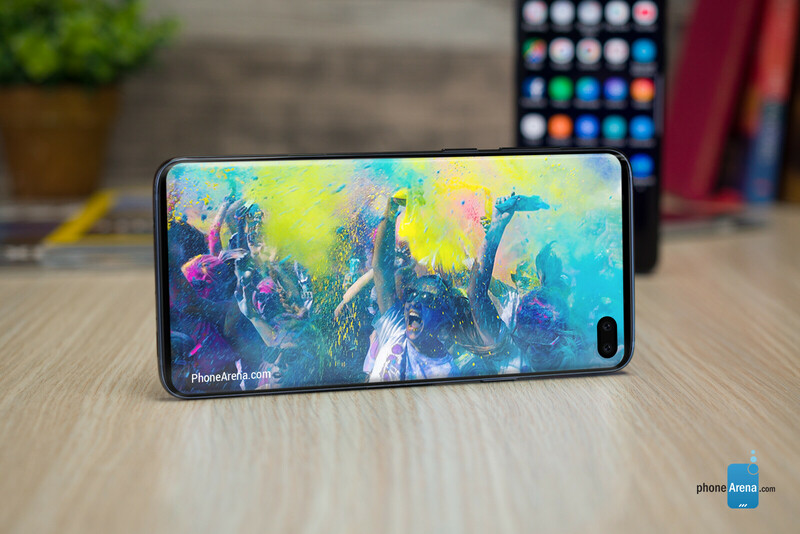 According to 91mobiles, the image above shows the Samsung Galaxy S10+ in a gradient color dubbed "Prism White". To be fair, we're having troubles spotting any traces of white here, as the device is mostly covered in shades of light blue and light purple. Nevertheless, we've known for a while that the Galaxy S10 series could have interesting gradient colors schemes, and Prism White seems to be one of them, with or without any real white in the mix. This allegedly official Galaxy S10+ render isn't too different from most of the previously leaked S10+ images. Compared to last year's Galaxy S9+, the new smartphone has thinner bezels and an off-center display hole that hosts a dual front-facing camera. On the back, the Samsung Galaxy S10+ features a horizontal triple camera. Wait, where's the fingerprint scanner? There is no fingerprint scanner in sight, but this doesn't mean the Galaxy S10+ lacks such a feature. As recently reported, Samsung may have found a proper way to integrate an ultrasonic fingerprint sensor under the display of the Galaxy S10+. At the moment, the only other handset that's officially sold in the US with an in-screen fingerprint scanner is the OnePlus 6T - in our experience, that sensor isn't better than a traditional one. But the scanner inside the OnePlus 6T uses optical, not ultrasonic technology, so there's hope that the S10+ will deliver a superior experience in this regard. The main specs of the Samsung Galaxy S10+ are expected to include a powerful Qualcomm Snapdragon 855 processor (at least in North America), 6 GB of RAM, up to 512 GB of storage space, a 6.4-inch display with 1440 x 3040 pixels, and a 4,000 mAh battery. Both the screen and the battery will be larger than those of the Galaxy S9+ (6.2 inches and 3,500 mAh, respectively). Just like its predecessors, the S10+ should be dust- and water-resistant, while keeping a standard 3.5mm headset jack and a USB Type-C port at the bottom. The new "official" Samsung Galaxy S10+ renders that make the subject of this article suggest that the handset will be released on March 8, as this date is visible on the home screen. We've heard about this alleged release date on at least two other separate occasions. Thus, barring any surprises, it looks like March 8 is indeed the day when the Galaxy S10 series will hit shelves in the US and around the world. Alongside the Galaxy S10+, other two new models are expected to be launched at the same time - a regular Galaxy S10 (possibly sporting a 6.1-inch screen) and a Galaxy S10 Lite that might be a tad smaller. Based on leaks and Samsung's own history of pricing flagship phones, we are assuming that the Galaxy S10+ will be sold starting at around $900, while the Galaxy S10 could cost $100 less. The Galaxy S10 Lite might be priced at under $700. Needless to say, US carriers will allow you to purchase Samsung's new phones with monthly payments, and we'll probably see various promotional offers and discounts available from day one. Wow, man. You're so cool and edgy for that comment. Good job. f**k Apple for always copying Samsung and not paying copyright fees. Nice looking device, I absolutely hate these cheesy gradient colours. This industry is so competitive that everything gets immediately copied, both the innovations and the nonsense. They are not gradient, it is iridescent. I want to buy a new phone in the coming months but it gets harder to choose as Huawei is getting really serious at making great phone (horrible notch though) but mate 30pro is far away just like the pixel 4 XL (who will probably be ugly af), OnePlus 7 will probably have a weak camera again and FHD+ resolution only I guess that's gonna be the S10+ but Sammy'd better step their game up when it comes to the camera cuz they're getting smashed by the competition. Apple? Out of question Any suggestion? What about the Huawei P30 Pro which is out at the start of the year? I feel like I'd need to see it with a video playing in full screen. I wished that bottom chin was slimmer, and symmetrical with the front one: otherwise I like it! I just don't understand, if Samsung can make such bottom bezel less screen for apple why they are not making one for their device. I guess it has to do with the curved screen how can you bend a rectangle from three sides ? Thats why the 10e has no chin! Samsung makes the display for Apple. They don't design what's around it.